The warm focused lighting in the University of Oregon Football locker room was designed to create a sense of pride and camaraderie. Its many rooms are a place to bond, learn and even meditate. 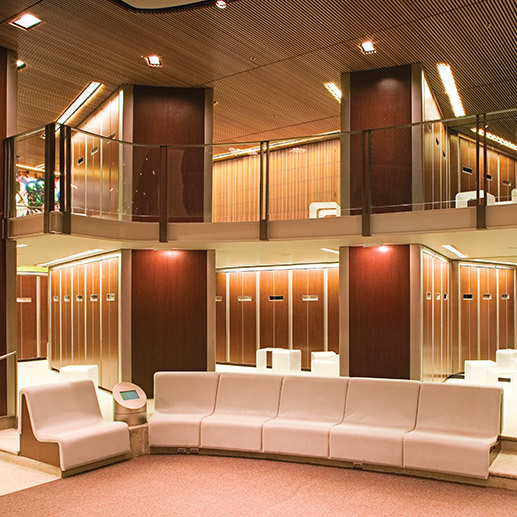 ELP’s DW Series fixtures with louvers wash the face of the lockers. Designed for close placement to the wall, the fixtures also direct light backwards, to help comfortably illuminate the space indirectly. This 2003, GE Edison Award of Merit, lighting design achieved 0.77 watts per square foot, which was well below the allowed 1.4 watts.